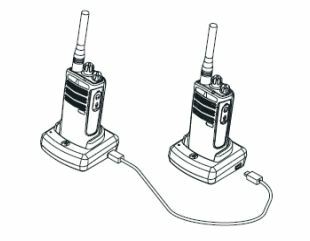 How to clone a Motorola CP110 portable radio without software | Magnum Electronics, Inc.
Cloning CP110 radios is easy if you have a RLN6309 multi-unit charger or two RLN6304 single unit charger pockets that are included with the standard radio packages. 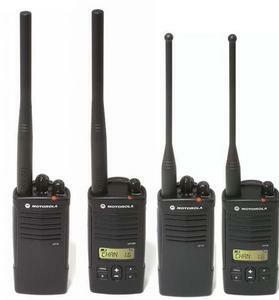 Make sure the source and target radios are the same band (VHF or UHF) and have the same number of channels (2 or 16). The radio batteries should be fully charged first because the AC power cables have to be disconnected during the cloning process. When using a multi-unit charger (MUC) the source radio must be in the odd pockets (1,3, or 5) and the target radio has to be in the even numbered pockets (2,4, or 6). Two single unit charger (SUC) pockets require a RLN6303 cloning cable connected to each data port. Hold the PTT transmit button and the bottom side button (SB2) simultaneously while turning the radio ON. Wait 3 seconds until you hear an audible tone indicating the radio entered cloning mode. The radio LED light will blink orange twice. Place the source radio in the charger pocket that pairs with the target radio and press and release the button under the PTT (SB1) to begin the cloning process. The radio LED will be solid orange while transferring the data. When cloning is completed you will hear a chirp tone indicating success or a bonk for failure. If you are cloning 16 channel radios you will see “pass” or “fail” on the display. It takes only about 5 seconds to complete the cloning process. Don’t forget to turn the radios OFF and back ON to exit the cloning mode. This entry was posted in Motorola, Portable Radios, Tech Tips and tagged clone, CP110, Motorola, RLN6303 by magnumelectronics. Bookmark the permalink.